Welcome Step in, kick off your shoes and relax! This beautifully appointed 6 bedroom villa offers over 2,200 sq ft of space from which to soak up the Florida sunshine and act as a home-from-home during your stay. Location With Disney and Universal Studios a mere 15-20mins drive away and your choice of restaurants, stores and amusements 5 minutes up the road, you will find yourself wanting for nothing. The best of Florida’s beaches are within easy driving distance too, making this villa a great choice for that complete Florida experience. Access and The Community The villa itself is located on a corner lot on the popular and part-residential Orange Tree Community situated on the US27. Airport access is easy as is interstate travel should you wish to go further afield. Orange Tree Community facilities include tennis and basketball courts, children’s playgrounds and a large playing field (situated directly opposite the house). The community itself is quiet and peaceful with little traffic to disturb your stay. The Villa The villa is on one-level, giving easy access for all, and comprises 2 spacious living areas (one with access to pool deck), a separate dining area, breakfast nook (again with pool access), fully equipped modern kitchen, fully equipped utility room, games room, 6 bedrooms and 3 bathrooms (see details below). It has been furnished to a high and exacting standard and has a modern, airy and spacious feel. All living areas, bedrooms and bathrooms are fully air-conditioned. The larger of the two lounges has a flatscreen TV and you also have access to free local phone calls and wi-fi. Bedrooms and Bathrooms The master bedroom, with king-sized bed, has a large ensuite with separate shower and bath. A flat-screen TV has been installed and a security safe is available for your personal items. Doors lead directly from the master bedroom out onto the pool deck – a wonderful feature to wake up to and enjoy throughout the day. Two further bedrooms, one twin and one queen, share a Jack-and-Jill bathroom with overbath shower and, at the rear of the villa, there are two more twin rooms and a queen room. The third bathroom has direct access out to the pool and is particularly useful for quick bathroom trips after a dip in the pool, or a shower after a hectic days’s sunbathing! All bathrooms are supplied with hairdryers for your convenience. Outside The pool is bathed in glorious sunshine all day through until late afternoon and is not overlooked. The pool deck backs onto a conservation area so you can enjoy complete peace and privacy. A large pool, plenty of poolside space and comfortable loungers mean that you can all enjoy relaxing outdoors, even when the house is fully occupied, and a covered lanai ensures that you can get some shade day-round if you need it. There is an outdoor table and chairs for some al-fresco dining and barbeques can be supplied (at a small charge) should you require one. For safety purposes, there is a child security fence around the pool itself; this can be conveniently folded back for pool access. Games Room The double garage has been converted into a games room and houses a pool table, foosball table, electronic darts board and is furnished with a bar table and bar stools for your comfort. Extras Almost anything can be supplied at your request, be it cots, high chairs, welcome grocery packages or golf clubs. A brief list is noted below as examples but, if you have any additional requirements not listed, please do not hesitate to mention it when booking as most requests can be accommodated. 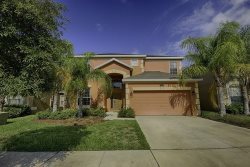 Welcome Pack ($45 plus – depending on pack chosen) Pool Heating ($25 per day)) Airport Pick-up (Orlando International Airport $110) Cot / Highchair Rental ($45 per week) Barbeque $70 per week In case of.... Our home is managed by the wonderful team at Homes of America. Their office is located 5 minutes from the house and is open daily during office hours. Emergencies can be dealt with 24/7 for your peace of mind and comfort. And finally.... In the words of Walt Disney: “Laughter is Timeless, Imagination has no Age, Dreams are Forever.” Enjoy your stay!